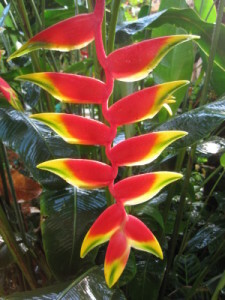 Heliconia rostrata is a highly exotic perennial from Peru and Argentina. It has huge paddle like leaves to 2m tall similar to a banana plant. From these, during the summer, pendant, zig-zag shaped, red and yellow flowers appear and are popularly sold at a price in florists. Heliconia must be grown in a tropical greenhouse or garden as they are huge plants and need a minimum winter temperature of 15c. They also enjoy lots of water, fertiliser and a semi shaded position. See ours flowering now in the Tropical House.